Interactive Metronome – Our clinic provides Interactive Metronome Services! The Interactive Metronome is a computer-based system that can objectively measure an individual’s timing, rhythm, coordination, and ability to plan actions. 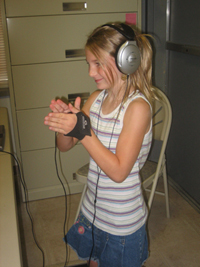 The goals of the Interactive Metronome are to increase functional neuroplasticity, improve timing, and to improve the brains efficiency and performance (IM Certification Course Provider Training Guide, 2008). The IM training program has been shown to improve: · Attention and Focus · Ability to tune out distractions and Multitask · Working memory · Impulse-control · Mental processing speed · Executive functions · Language processing · Math skills · Reading skills · Coordination · Self-monitoring. Interactive Metronome can improve areas in disorders including but not limited to the following: · Developmental delay / disorders · Learning disabilities · Dyslexia · Nonverbal learning disorders · Apraxia · ADD / ADHD · Auditory / Language Processing Disorders · Autism / PDD · Sensory Processing Disorders · Cerebral Palsy · Fetal Alcohol Syndrome · Stroke / Brain Injury · Parkinson’s · Multiple Scoliosis · Limb amputations · And more . .